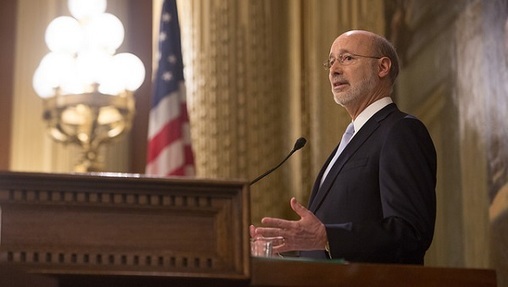 HARRISBURG, PA (WSKG) — For the first time in Governor Tom Wolf’s tenure, he has signed a budget. And after three years of protracted negotiations, the election year plan is finished well ahead of its June 30th deadline. The modest, compromise measure spends $32.7 billion–a roughly two percent increase over last year. New spending goes mostly to public schools, pensions, prisons and human services–including about $800 million in one-time funding for Medicaid that was moved off-budget, which will have to be filled in again next year. Republicans cheered the lack of new taxes. And both parties touted the plan’s $70 million in new school safety funding. Democrats, like Senator Anthony Williams of Delaware County, were especially pleased about $7.5 million of that money being earmarked for community anti-violence efforts. In lieu of the public budget battles that have played out in recent years, negotiations happened mostly behind closed doors, with the commonwealth’s strong tax collections greasing the wheels. All told, the public part of the process took about three days from start-to-finish. Along with the flurry of budget bills, the House and Senate used the high-intensity week to push some unrelated initiatives over the finish line. One of the biggest landmarks was a measure commonly called the “clean slate” bill. If certain low-level, nonviolent offenders go 10 years without getting arrested again, the bill would seal their criminal records–a boon for people trying to get jobs. The concept enjoyed bipartisan support this session–though Democratic Montgomery County Senator Vince Hughes noted, it has been around much longer. “Even though we told folks back in, what, the mid-90s that a lot of the ‘tough on crime’ stuff was not going to work, it took over 20 years to get around to this kind of conversation,” he said. Governor Tom Wolf hasn’t signed the clean slate bill yet, but intends to. He would also sign a bill making it more difficult for people under restraining orders to possess weapons–but the House hasn’t managed to pass it yet. They’re expected to take it back up Monday. Senators say that’s one of two bills they might return to session to vote on. The other is a sweeping redistricting overhaul that is currently bogged down under more than 700 House amendments.